Make sure you have an extra towel or wet wipes just in case your new Yorkie puppy happens to experience car sickness or motion sickness which is not uncommon. Most will grow out of car sickness over time. Also keep the vehicle a nice cool temperature. Don’t wrap up the puppy, this might make it worse. Short car trips at first are best if possible. 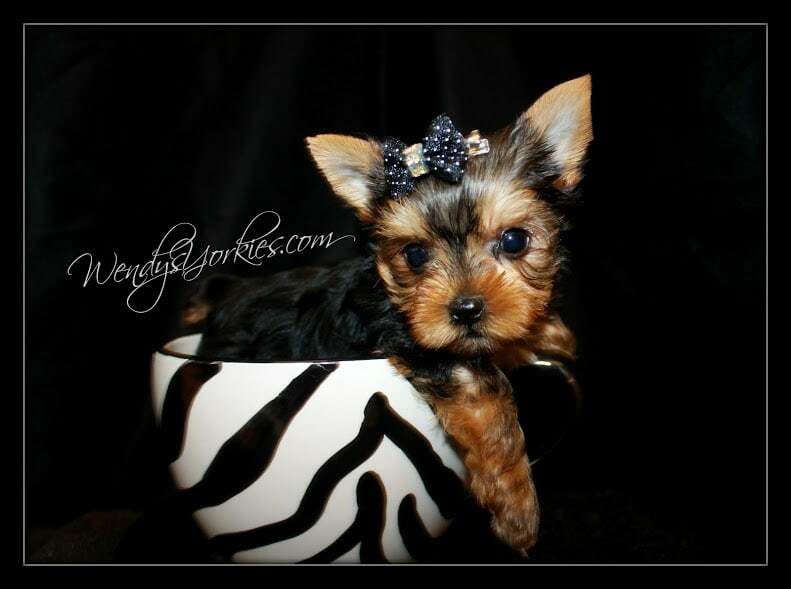 Once you are home with your new Yorkie puppy you can offer them fresh water and food. A calm quite room is best to let the puppy get settled in to at first. You can also let the puppy down in yard or onto wee pad in case they need to go. If the puppy has had motion sickness, you can give them a pea sized amount of the calorie gel you were given. This will give them a little boost, but not too much. It is much better for them to eat the dry Royal Canin Mini puppy food they have been use to eating. Although you are excited to see and experience play time with your new puppy, you want to take it easy for the first couple of days and let them get settled in and use to their new home. After the first couple of days your new puppy will have had time to sniff around and know this is home!They will really start showing their personality’s by this time, sometimes sooner. Just limit play time for the first few days. Your new puppy has never been alone up to this point, so they may or may not cry the first night. I recommend a collar with bell attached so you can hear if your puppy wakes before you. If you are a heavy sleeper then co-sleeping may not be a good idea. You can always have a puppy pack and play in your room with wee pads, food, water and a nice soft bed. I will try to always make myself available for any questions you might have, you are always welcome to call or text me. If I don’t answer I will get back with you asap. Emailing me is always an option as well. Check back I will add more hopefully useful information. If there is a specific topic you would like to hear about please let me know!